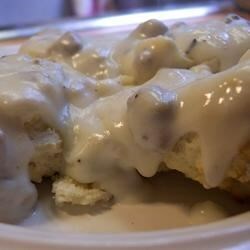 "'We enjoy these flaky biscuits covered with creamy gravy not only for breakfast, but sometimes for dinner,' reports Darlene Markel of Sublimity, Oregon. Priced at only 27 cents per serving, 'It's hard to find a more stick-to-the-ribs meal and at such a low cost,' she notes." In a bowl, combine flour, baking powder and salt. Combine milk and butter; stir into dry ingredients just until blended. Drop by rounded tablespoonfuls onto a greased baking sheet. Bake at 450 degrees F for 10-12 minutes or until golden brown. Meanwhile, in a saucepan, cook the sausage over medium heat until no longer pink. Stir in butter until melted. Sprinkle with flour. Gradually stir in milk, salt and pepper. Bring to a boil; cook and stir for 2 minutes. Serve over biscuits.